Join us for the 6/5 MLP CCG Prerelease! Psst! We’re having a pre-release and you’re invited! 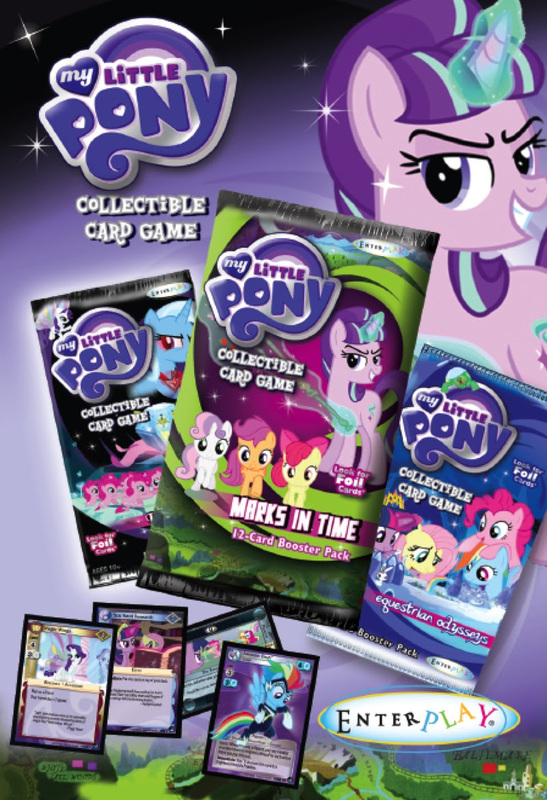 On Sunday, June 5 at 12noon, will be hosting the MLP CCG Marks in Time prerelease. Each participant will receive eight Marks in Time booster packs. The participants will have 45 minutes to put together a deck out of the cards they get in the packs. The main deck should have no fewer than 30 cards, & no fewer than 5 problem cards. Participants will then partake in a Swiss-system tournament. The games will be played best of one. If you don’t pull any starting problems, that’s ok! We will have plenty of EO Block starting problems for you to borrow. Just remember to return them at the end of the tournament. Thieves will have their right hand cut off. You’re allowed to bring your own Mane to use, but we ask that it be an Ambassador card. If you don’t have one, we’ll be able to provide you with one. The same rule applies with the problems, so if you like your right hand, mark sure to return them. If you happen to pull a Mane in a pack, you may use it instead of an Ambassador. The participation fee is $25. Contact us at info@newwavecomics.com so we can get you registered!